Hey guys! Another travel post here. I really enjoy making them once I get into the groove! Osaka was a spontaneous decision while in Kyoto because there was a slight change of itinerary. If you only plan on staying in Osaka for one full day like how I did, you can spend your time in Minami, which is the southern downtown area of Osaka. When you first arrive, one of the first things you will see is the popular Glico Man on one of the buildings. When I went in January, it was pretty crowded and you will find yourself making your way into the Dotonbori area where there is an endless selection of food. A must-see for all the food lovers. You can stay til the evening when all the neon lights are lit up, including the Glico Man by the river for a scenic view. I only spent a full day there instead of staying overnight because my friends and I traveled back to Kyoto where we were originally staying. 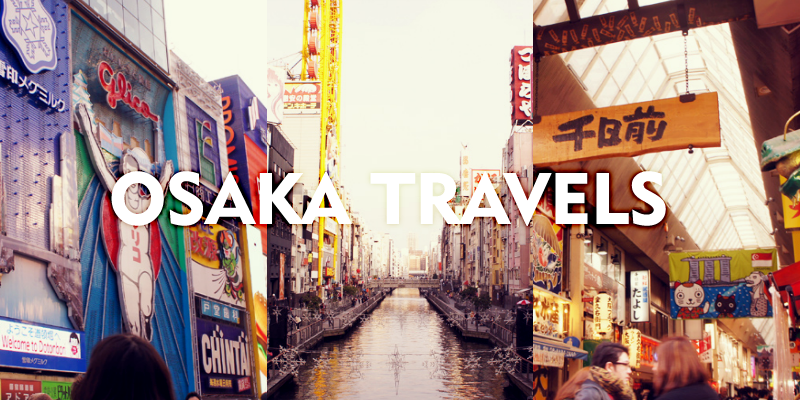 → Similar to Tokyo, Osaka offers shopping, dining, and entertainment but is a less populated city. → Train: Kyoto Station to Namba Station (Osaka) is roughly an hour. Before you travel to Japan, you can buy a JR Rail Pass at JRPass.com (available for purchase for $279 in the US, not available to Japanese residents) that will be shipped to your home via FedEx. This may save you a lot of money if you plan to travel via train several times in Japan (can also be used in the subway for JR lines). At the airport, there is a JR Pass service area where you show them your pass you received in the mail and they will give you the actual official pass that is stamped for you to use whenever you ride the train. The option I chose was a 7-consecutive day pass with unlimited usage within the 7 days, beginning the first day you use it in order to travel from city to city in Japan. Prior to boarding a train, seat reservation is available but not required. Just show your official pass at the gate and then you are free to board a train. Destinations and train times are listed on the monitors above you in the station, but be aware that there are faster and slower trains. The JR Rail Pass can also cover your subway transportation if you are using a JR Line; just ask at the gate. If you are ever lost, just ask an attendant as most are very helpful even with little English. → Dotonbori: This whole area is dedicated to a large variety of restaurants, bars, and more. → Glico Man: Popular large sideboard attraction of Osaka that features an athletic man running on a blue track that lights up. → Dotonbori Canal: A canal that runs through Namba and is surrounded by tons of entertainment. → Ebisubashi: The bridge located in front of the Glico man. A nice view for tourists to take photos of the neon lights. → Shinsaibashi Shopping Arcade: A shopping center consisting of different boutiques and designer brand stores. It is not part of Dotonbori but not too far away if you just keeping walking north after crossing the Ebisubashi bridge. View of the river running through Minami. It gets pretty crowded during the day because there are tons of food to choose from. View of the river at night. Ending the night with drinks and friends.